Global GPON equipment market expected to reach USD 25.82 billion by 2024, growing at a CAGR of around 24.72% between 2018 and 2024. GPON infrastructure consists of single optical fiber that can be accessed by multiple users with the help of passive optical splitters. The report analyzes and forecasts the GPON equipment market on a global and regional level. The study offers past data from 2015 to 2017 along with forecast from 2018 to 2024 based on revenue (USD Billion). Assessment of market dynamics gives a brief thought about the drivers and restraints for the Gigabit Passive Optical Networks (GPON) equipment market along with the impact they have on the demand over the forecast period. Furthermore, the report includes the study of opportunities available in the GPON equipment on a global level. The report gives a transparent view of the GPON equipment market. We have included a detailed competitive scenario and portfolio of prominent vendor’s operative in the GPON equipment market. To understand the competitive landscape of GPON equipment market, an analysis of Porter’s Five Forces model for the market has also been included. The report offers market attractiveness analysis, wherein component type, product type, and regional segments are benchmarked based on their general attractiveness, market size, and growth rate. The report provides company market share analysis in order to give a broader overview of the key players in the market. In addition, the report also covers key strategic developments of the market including acquisitions & mergers, new product launch, agreements, partnerships, collaborations & joint ventures, research & development, product and regional expansion of major participants involved in the market on a regional basis. The study provides a crucial view of GPON equipment market by segmenting the market based on component type, product type, and regional segments. 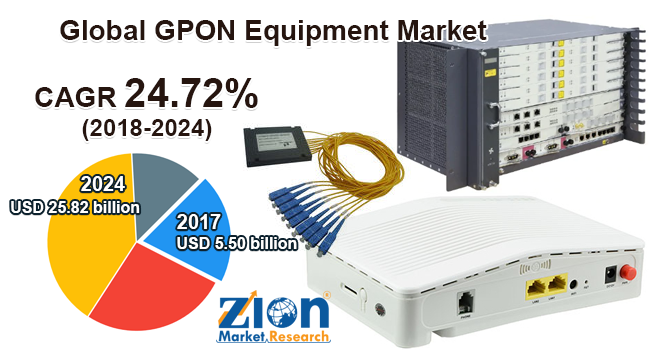 All the component type, product type, and regional segments of GPON equipment market have been analyzed based on present and future trends and the market is estimated from 2018 to 2024. The component segment includes optical filters, optical cables, and wavelength division multiplexer/demultiplexer, and optical power splitters. The product segment includes an optical line terminal, an optical network terminal, and passive optical splitters. The market is analyzed based on five regions namely North America, Europe, Asia Pacific, Latin America, and the Middle East and Africa. The prominent players in the GPON equipment market are Huawei Technologies Co. Ltd., Verizon Communications Inc., Mitsubishi Electric Corporation, Alcatel-Lucent S.A., Adtran Inc., Calix, Inc., ZTE Corporation, Freescale Semiconductor, Inc., Motorola Solutions, Inc., Ericsson, Inc., Alphion India Pvt. Ltd., Broadcom Corporation, Inc., and Hitachi, Ltd.